Last week I attended lecture-dems showcasing the work of two young choreographers, both of whom are also members of New York City Ballet. I wonder what they’re putting in the rosin over there at the StateTheatre, because there really seems to be an upsurge in creativity in the ranks. (But why, still, no women choreographers?) The notion that ballet is a languishing form flies out of the window when one sees their work and hears them talk. 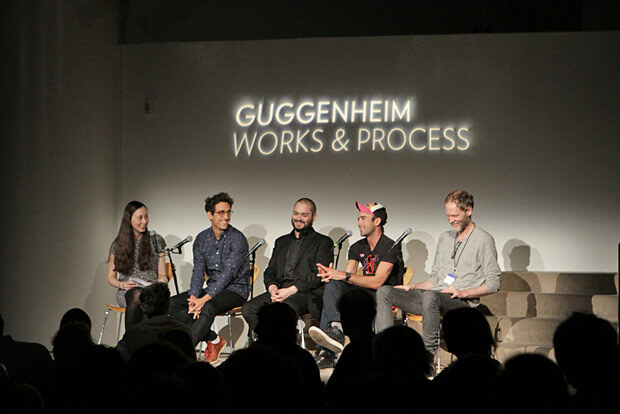 Works & Process talk at the Guggenheim: Ellen Barr, Justin Peck, Michael P. Atkinson, Sufjan Stevens and Karl Jensen. Photo by Jacklyn Meduga for Works & Process at the Guggenheim.